California had the highest poverty rate of all states, almost 24 percent in 2011, under the Supplemental Poverty Measure (SPM) developed by the Census Bureau, followed by Florida at 20 percent. The official poverty line, based on the cost of a minimally adequate diet and multiplied by three, was $10,890 for one person and $22,350 for a family of our in 2011; it found that 16 percent of California residents and 15 percent of Florida residents were poor. 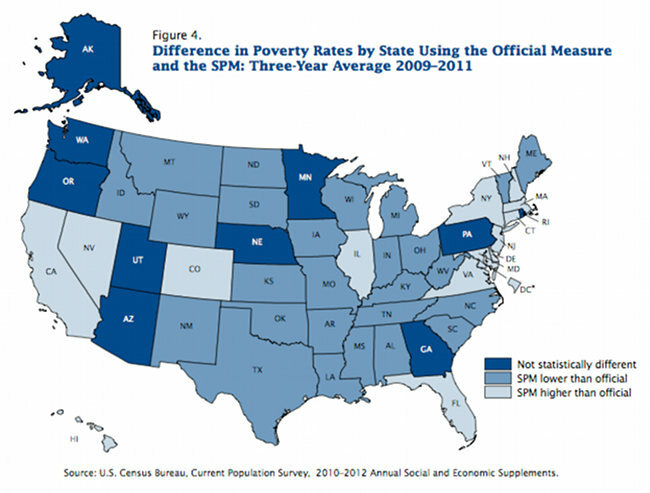 The SPM finds that 14 states with higher-than-average living costs had higher poverty rates under the SPM than the official poverty line (lighter color), while 26 states including Texas had lower poverty rates under the SPM than the official poverty line (darker color).